Tokyo doesn’t have a claim to the sea, but it certainly cares about what happens there. In recent weeks, the world has turned its collective attention to China’s intensive artificial island building activity in the South China Sea, where the Paracel Islands, the Spratly Islands, the Scarborough Shoal and a number of other features are disputed territory. Although Japan is not directly involved in the disputes – China, Taiwan, the Philippines, Vietnam, Malaysia, and Brunei have overlapping claims – it is nonetheless an interested party. Japanese policymakers closely monitor developments in the South China Sea and seek to shape both actual Chinese behavior and the global discourse about such behavior. 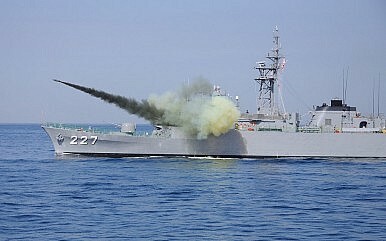 For Japan, a major concern is that the handling of the territorial disputes in the South China Sea could set a precedent with the potential to negatively affect how China will act vis-à-vis Japan in the East China Sea, where the Senkaku/Diaoyu Islands are disputed between Japan and China. If Chinese leaders see their strategy of unilaterally changing the “facts on the water” through increased patrols and island-building go unchallenged in the South China Sea, they may be emboldened to try a more aggressive strategy in the East China Sea. Island-building specifically is not an issue in the East China Sea – what is really at stake for Japan in the South China Sea is the larger issue of offering credible support for smaller states’ sovereignty claims, or at least supporting their right to settle border disputes without threats or the use of force. Japan cannot afford to let the major powers passively sit on the sidelines while China solidifies de facto control over disputed features in the South China Sea through a series of faits accomplis achieved through intimidation. Read the rest of this article in the July Issue of The Diplomat Magazine, a monthly digital publication packed with exclusive articles and available for download in the Apple App Store, Google Play, or via Amazon.